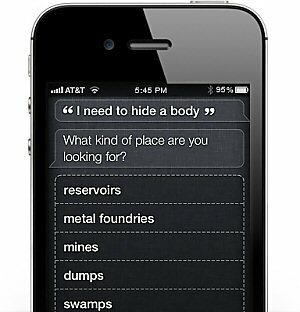 My cellphone knows where the bodies are buried! I should explain. 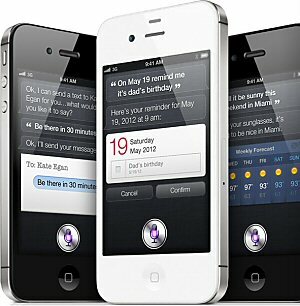 I just got a new iPhone, which as you may know has an integrated “personal assistant” named Siri. The female voice of my iPhone, Siri, is very helpful; perhaps too helpful? The idea is you can raise the phone to your ear and ask Siri to do things, e.g. “Remind me to stop and pick up milk on my way home tonight”. I did that just now, and this is what it said. Okay, Michael. I will remind you to stop and pick up milk when you leave, or at 7pm. Why don’t we just be friends? Wait… there are other phones? And lastly, I can’t recommend you do this as Big Brother is likely watching, but if you ask it for a good place to hide a body, it is frighteningly helpful. This is what what it said. I’m not kidding. When you select English (US) Siri an annoying female voice (hey, I’m still hurt about the whole, “Let’s just be friends, thing”). If you switch it to English (UK), French or German it’s a guys voice. What would you like me to ask Siri? ps. what did your wife think? I didn’t know i could get a male assistant if I changed to UK. Tomorrow I am ON that. As you may/may not know I am currently in the Dallas area, so this is the 1st chance I’ve had since I arrived last Wednesday to check any blogs! This one was quite entertaining. I’m certain you intended just that. I’m sure you are just gonna love the 4S…Have a lovely day, and just in case I don’t get the chance to tell you guys later…have an Amazing Thanksgiving! Big hugs to you all! Hello, Leah. No, I am almost never online and missed the fact you are in our neck of the proverbial woods. Yes, I am enjoying my iPhone 4S and Siri, thanks. You and yours have a very safe and happy Thanksgiving, too! ♥ Hugs ♥ right back at ya!